XIAOLU'S NOTES: Don't forget to let the frozen grated cassava thaw in the refrigerator for 1 day before making this recipe! Macapuno is usually sold as coconut strips in syrup inside of a glass jar. You can find macapuno at most Asian grocery stores. After taking the 2nd egg white for the batter, RESERVE the yolk for use in the topping. Preheat oven to 400 degrees F. Coat/line a 8-inch square baking pan with cooking spray, a thin layer of oil, or parchment paper. Dissolve cornstarch in water, then add all remaining cake base ingredients in a large bowl, whisking until evenly combined. Pour the batter into the baking pan and bake for 35 minutes. Begin preparing the topping as soon as the bars go into the oven. Dissolve cornstarch in 2 tablespoons of coconut milk, then add the rest of the topping ingredients EXCEPT macapuno and mix until evenly combined. Transfer this mixture into a small saucepan, and cook on the stove over medium-low heat, stirring constantly, until the mixture thickens. Remove from heat right away, stir macapuno into the thickened topping mixture, and set aside. 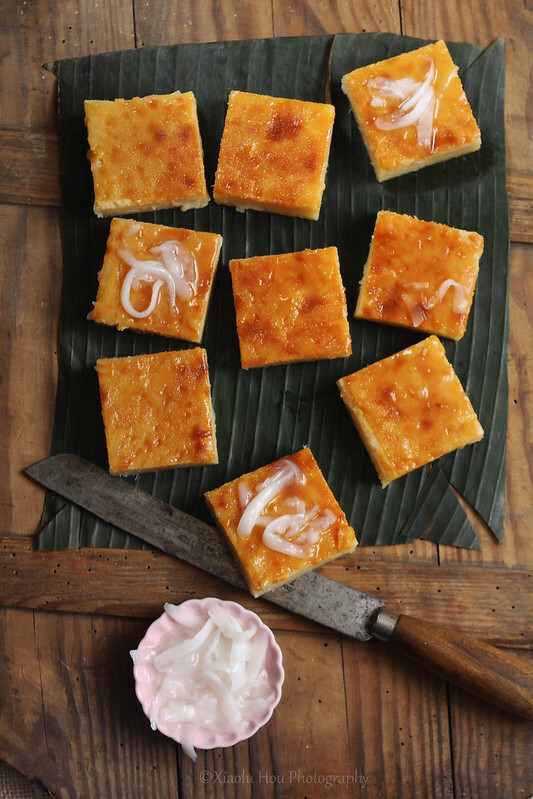 Remove cassava bars from the oven after 35 minutes of baking, immediately pour the topping mixture over top of the bars, and spread topping evenly with a spoon or spatula. Increase oven temperature to 425 degrees F, then return pan to the oven for 15 to 20 more minutes, or until top turns golden brown. Transfer pan to a cooling rack and let cool completely before slicing into bars with a serrated knife. Serve with more macapuno as an optional topping. Wonderful! This cake must taste divine. So happy you're back! These look phenomenal! Thank you, Katrina -- I'm glad to be back! So glad you're back!! The photo is gorgeous, as per usual. And cassava is the best. Thanks, Joanne! You're the best =D. Thanks, Kulsum!! It means a lot from you <3. How are you? I'm trying to get back into blogging but WOW is grad school busy. I appreciate your support re: the photo...it's mostly that the bi-directional light (the room I photograph in for the new apt has windows on 2 sides that I hadn't learned to control for yet) is causing shadows in different directions. Mostly it's the shadow for the top right bar that's driving me nuts. Since you expect its shadows to be like all the others, I think the difference gives the photo a weird artificial feel. It's so great to see you here again! These look delicious and CONGRATULATIONS on all the life changes! !